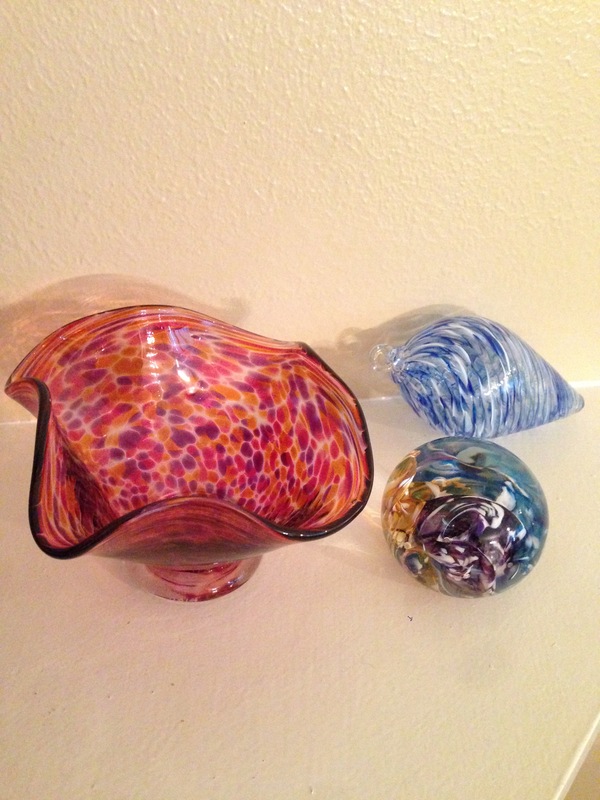 Glass blowing is something I had always wanted to try. When I wrote my bucket list, it was among the many things which I thought seemed distant and unrealistic. In fact, the bucket list in it’s entirety seemed that way when I first wrote it. That’s worth it’s own entry, though. I digress. I didn’t take any photos while I was in the studio, because I was elbows deep into molten glass. Not really, I just like how terrifying that imagery is. I don’t know why I assumed that blowing glass wouldn’t be difficult. Perhaps it was the Chihuly videos I had watched the day before at the exhibit, where I saw the ease only a genius of their craft could have doing their work firsthand. Everything about it was challenging. We had to place a cement block next to the furnace just so that I’d be able to reach into it to efficiently place the molten glass on the pipe. The glass was, as you would expect, lava hot. The distance at which you had to be was close enough was painful. I wondered if I should have worn sunscreen. You’d really think I would have taken the heat to MELT GLASS into consideration, or that the last twenty five years of enduring Texas summers was training for this day. Nope. Inside the furnace was fluorescent orange from the immense heat, with the vat inside filled to the brim with clear molten glass. When you’re gathering the glass to the pipe, the glass has the density of molasses. You’ve got to lightly dip the pipe into the glass and quickly take it out of the vat while spinning the pipe, but leaving it in the furnace. However, the glass is invisible and your eyelashes are being singed off while you’re looking for it. Watch out for that. You repeat the dip, lift, and spin process a few times, until you have enough glass on your pipe. Then you take it over to an area with a tub of water, roll the parts of the pipe that don’t have the glass on it in the wetness to cool it, and by then the glass has also had a moment to cool. So you take the pipe to another oven. This one doesn’t have molten glass inside and it’s a bit cooler, at roughly 2349826352001 degrees Fahrenheit. I resisted the urge to put on my sweater. They call this oven the Glory Hole. As in, “I put my rod into the glory hole” or “Its really hot on the other side of the glory hole” or “Don’t get to close to the glory hole, or it’ll melt your face off.” Through the process of shaping and blowing the glass, you will frequently return to the glory hole to keep the glass hot enough to manipulate. You can shape the clay by using various tools: over-sized tweezers, some intense looking scissors, wooden molds, and the A, B, and C section of a newspaper, folded up into a five inch square and submersed in water. The tweezers seemed like they’d be the coolest, because you could pull the glass into shapes. If you were good at it. If it’s your first time, it feels like there’s another human equal your size pulling in the opposite direction of the glass so that you can’t do it. But there isn’t, it’s just glass. And it’s hard to move glass no matter how hot it is. With a lot of help from the instructor, I ended the day with a paperweight, an ornament, a candy dish, and a disfigured octobust for Tobias. (I meant to type octopus, but I felt that typo was appropriate. I’m just instinctively funny like that, I guess.) It was really cool, in a burning lava hot kind of way, and I would definitely go for another shot at it, with hope I would get better with practice.